The Wednesday Washington Post Food section is my guilty lunchtime pleasure. Just before Thanksgiving there was a special on Julia Child & Jacques Pepin "deconstructed turkey" that looked amazing (and required a 2 page(!) recipe). I took it home and showed my mom. Yes I stole the Food section from the paper and work and packed and flew home to Kansas with it to show my mom. She agreed that it looked fabulous and like a lot of work. There was also recently a recipe for "man crepes" that I've been thinking about making. Anyway, about a week ago, the post did a feature on cookies - 12 cookie recipes for the holidays. Is it any wonder I love it? 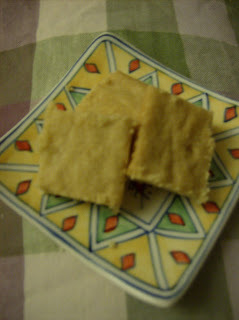 I decided to make the brown sugar shortbread (links to recipe at the Washington Post). You need a free account to view recipes on the post website, so I've reproduced the recipe below. Plus I'm not sure how long they archive their recipes. Anyone have any idea? Combine the butter and both sugars in the bowl of a stand mixer or hand-held electric mixer; beat on medium speed for about 1 minute, just until blended. Scrape down the sides of the bowl, then add the vanilla extract and salt. Add the flour in 2 additions, beating just until incorporated. Use your fingers or a sturdy rubber spatula to press the dough evenly over the bottom of the pan. Bake for 50 to 55 minutes or until the shortbread is golden brown. The edges will be slightly darker; do not underbake. Transfer the pan to a wire rack; let cool in the pan for 5 to 10 minutes. Use a sharp, thin-bladed knife to cut the shortbread, still in the pan, into 36 rectangles. Let cool completely in the pan before serving or storing. So this turned out nice, I'm taking them along with some Spitzbüben, if there are any left, to my work Christmas party. However, I did grease the pan (uh-oh) and the recipe says not to, but nothing happened so far as I can tell. Also, DO NOT bake it for 50-55 minutes, mine were nicely brown in 25-30 minutes. So you might wanna watch them. If I make these again, I think I will try using all brown sugar and no white sugar because I thought these would be really brown sugary but they're not. However, they do have a delightfully soft texture.